As a first timer, I am pretty sure you do not want to spend on something expensive. It is wise to start with a small and affordable set. 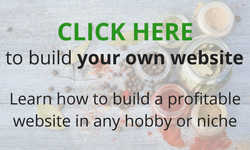 As you gain more experience and knowledge in growing your own herbs indoor, scale up from there. Initially, I was a little bit confused by the term herb kit and starter kit. Helping you to understand, a starter kit is used to start the growing process from sowing till the seedling stage. After which, you will need to transplant them into bigger pots. Type of pots. While some companies may give a decent size, others may only provide the little peat pots for growing the seedlings. But it is good to know that these peat pots can eventually be placed directly into the potting soil during transplant. Potting Soil. Most kit comes with fibre or coir soil, in compressed form. However, don’t be surprised if none is included because I spotted a couple during my search. Remember to look out for this when you are searching for yours. The fibres provide abundant oxygen which reduces root rot from over watering, the number one reason for plant failure. Seeds. Each kit comes with a different variety of herbs seeds. Choose the one with your favourite herbs included. So then you will get to use your herbs as soon as they are ready to be harvested. A good indoor herb garden kit includes everything you need to grow your herbs from sowing to harvesting. Though, not all kits available in the market fulfil this requirement to a tee. I have looked around and managed to find several that closely match this condition. Sharing my findings here hoping that it will help you make a better decision in buying yours. This being the most affordable set includes everything you need to start growing your indoor herbs. Since this kit comes with peat pots, you will have to transplant the seedlings to a bigger pot when the time comes. However, they are biodegradable so you need not take the seedlings out. Simply place the peat pot directly into the larger container. In the instruction manual, it was stated that the seeds need to be soaked overnight. To make it easier, just fill the seed bags with water overnight to soak the seeds and pour them directly into the peat pot. The pots are approximately 3 inches in diameter, adequate for many seeds to sprout. Additionally, they don’t take up much space when germinating. Not many of us have a nice, big window sill, especially those living in an apartment. 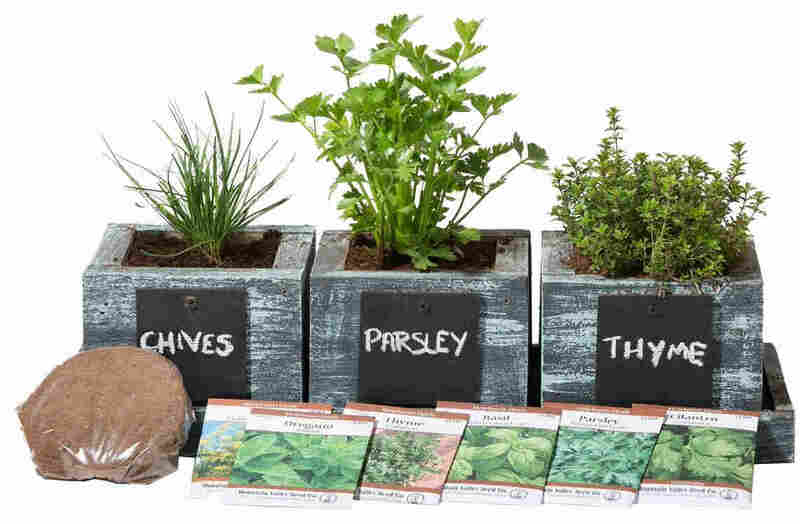 Not only affordable, but this is also a simple and straightforward herb starter kit that any beginners can start their herb planting as soon as they received theirs. 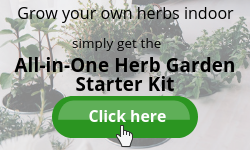 This is another affordable, simple and straightforward herb starter kit with everything you need to begin with, all in one box. The diameter of the pot is slightly bigger than the EasyStart Kitchen Garden Herbs Kit, at 3.9 inches. Still good for the window sill. This kit has the best-growing success rate in the country. The seeds are 100% organic and Non-GMO, open-pollinated and naturally grown in the USA. Being the #1 Best Seller on Amazon, this is worth taking a closer look. 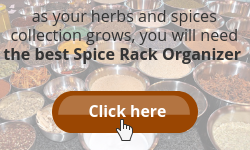 This is one herb starter kit that should not be missed out from this review. It is Amazon’s #1 New Release. Instead of including plant markers, this kit comes with pre-labelled pots. Saving you the trouble to mark the plants. Simply match the pots with the seeds. There are instances where I forgot which seed I planted in the pot when dealing with a variety of them. Does it happen to you? A definite advantage of this kit is the inclusion of the pre-moulded raised trays for optimal drainage. Furthermore, they hold the pots neatly in place, creating a lovely sight on your window sill. To note – the pots are not round but square at 3 inches wide. With a price tag at about $40, this kit may be a bit pricey. But having 10 variety of Non-GMO heirloom herb seeds plus the 2 units of the tray, this is a pretty good buy. Not forgetting the full-colour 28-page herb planting guidebook filled with illustrations, harvest and seed saving advice, recipes, FAQ and tips. This is one true indoor herb garden kit that allows you to sow and grow your herbs without transplanting to a bigger container. The rustic charm planters for this kit is surely a win over. They are of great value and just the right size for your windowsill at 4 inches height x 4.25 inches width. 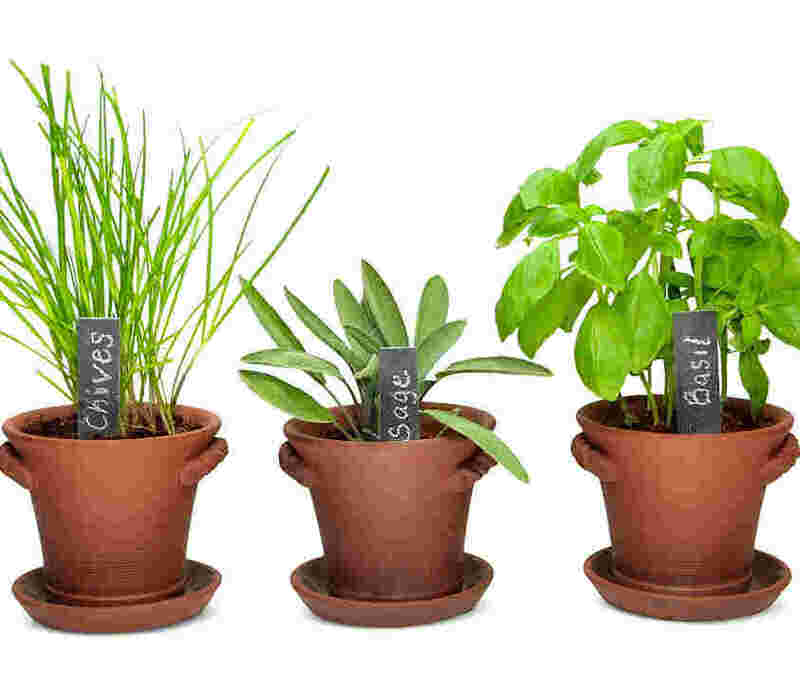 You may reuse the planters to grow more herbs after the initial are overgrown. Or use them to grow other plants. Different from other herb kits, this provides the germination bags. The purpose of the bag is to create and maintain an ideal germination environment. Seeds need moisture and warm temperature to grow. Just remember to remove the bag once they start growing. You don’t want to suffocate a growing plant, do you? The slate markers provided in this kit is another advantage. You can write the names of the herbs you are planting and in time to come, easily erase it to use for another herb. It pairs beautifully with the Rustic Charm Pots. With only three variety of seeds in this kit, there is a big chance that they may not be the herbs of your liking. However, you can buy the herb seeds separately. This may be on the pricey side. 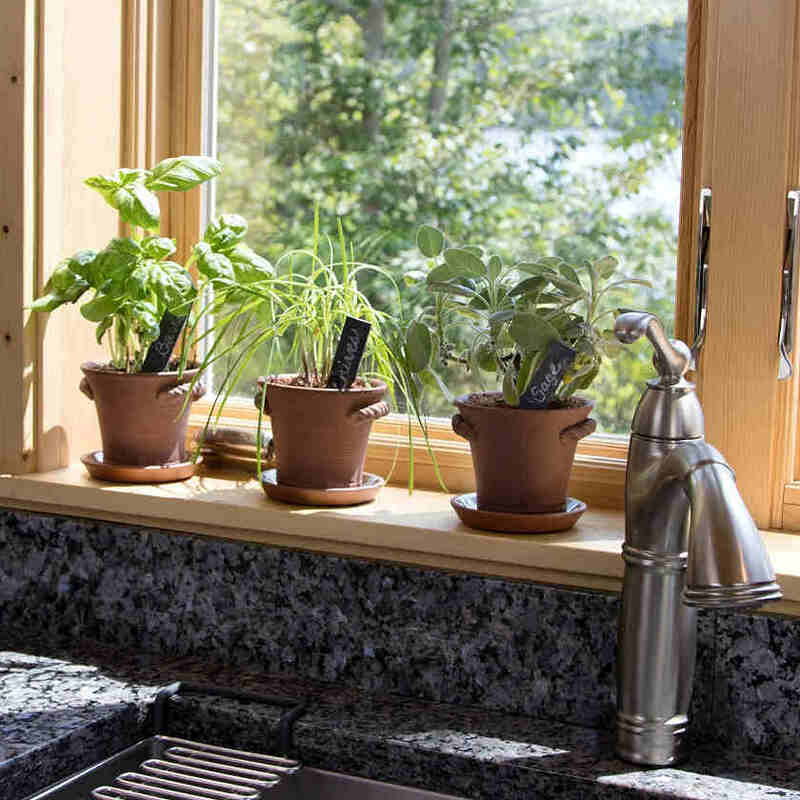 But imagine looking at these beautiful Rustic Charm Pots with herbs growing healthily on your window sill. Did it charm you into buying? No matter what your decision is, you must check this out. Unlike the Rustic Charm Herb Trio Kit by Window Garden, this herb garden kit comes with 6 variety of herb seeds. More options for you. Meaning there are chances that you will be getting your favourite herbs. However, you will have to choose which to grow because there are only 3 planters. You may consider growing the other 3 herb seeds at another time as they can be kept for up to 3 years. 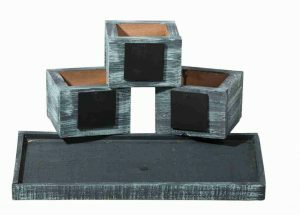 The planters are handmade in the USA from naturally rot resistant and insect resistant ¾” thick cedar wood, measuring 5” x 5” x 5”. Comes with a matching drip tray measuring 17” length x 6” width. Although the drip tray’s purpose is to catch water from the planters, there were several incidents listed that it isn’t waterproof. Therefore, take precaution not to over water your plants. Alternatively, bring them to the sink for watering and once they are drained through, put them back. It takes about a minute each. Growing herbs indoor need not necessarily be in a pot. These cute mason jars do the job as well. The only thing you have to provide is water. Make sure not to over water though. Damp soil is best but doesn’t leave a pool of water on the top of the jar/soil. For optimal growth, you have to place the planted jar in a bright area but avoid the direct sun. If none, a grow light will help. Click here to check out my grow lights review – from the most economical unit to the costlier version. The 3 herb seeds provided may not be your favourite, however, you can easily buy yours on Amazon. When your herbs start to grow and doing well, don’t be surprised if they outgrow the jar. Then, you will have to transplant them into a bigger pot. Hence, you get to reuse the mason jar to start the growing cycle again. An opportunity to try other herbs. These are the 6 various indoor herb garden kits that you may consider using to kick-start your intention of growing herbs indoors. The most common problem when starting herb seeds indoor is mould. From all the customer reviews I have read, the mould is the most common problem faced by users of all the indoor herb garden kits. In fact, I experienced the same too while growing mine. Either growing from seeds or propagation. Super common that is can happen to everyone. It is not the cause of seedlings dying. Remove white mould on top using a small spoon or knife. Gently scrape off the mould from the top of the soil. Do not over water your seedlings. You need to keep the soil evenly moist but must allow it to dry out slightly on top between watering. Be mindful not to let the soil dry out completely. Provide better air circulation around your plant. Do not crowd the pots too closely together. You may consider placing a small fan set at the lowest speed near your seedlings. In this case, the soil will dry out faster and you will need to keep a close eye on the moisture level. Also, you need to thin out the seedlings to provide better airflow. Do not pull the seedlings out of the soil as this will damage the delicate roots of the other seedlings. Use small scissors to cut off at the base. By thinning out the seedlings, you will be giving the others plenty of room to grow! There you have it. Hope this piece of information will help you when the time comes if it occurs. Do you want to know what I did with mine before this? I threw away the whole pot! Thinking it might spread to the others. Now, I know better. So do you. What are you waiting for? Let’s get growing! Oh yes, firstly, you need to buy your Indoor Herb Garden Kit. Beginner or not, it will be a good family project to work on. Or as a gift. I found this notable book on Amazon and must share it with you. This book shows you how to grow your own herbs on a window sill, in pots, on the patio or in a vegetable garden. It contains step-by-step photographs on how to plant, nurture, harvest and store your herbs. Additionally, it includes more than 30 recipes and flavour charts that list the best herbs to pair with popular ingredients. Not only an excellent book of knowledge for growing herbs but also a great companion for a cook. You will be amazed by the 150 different culinary herbs and their varieties listed in this book. Once you have your herbs, there are many ways to use them. You may even use herbs to relieve stress and anxiety, lose weight and reduce stomach bloating and gassiness. Also, consider to make yourself a smoothie with fresh herbs! 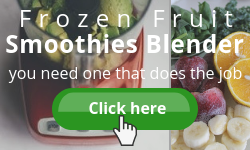 Click here to find out how to make a healthy smoothie without a recipe or try juicing with herbs. Alternatively, click here to learn how to make herb infused oil. 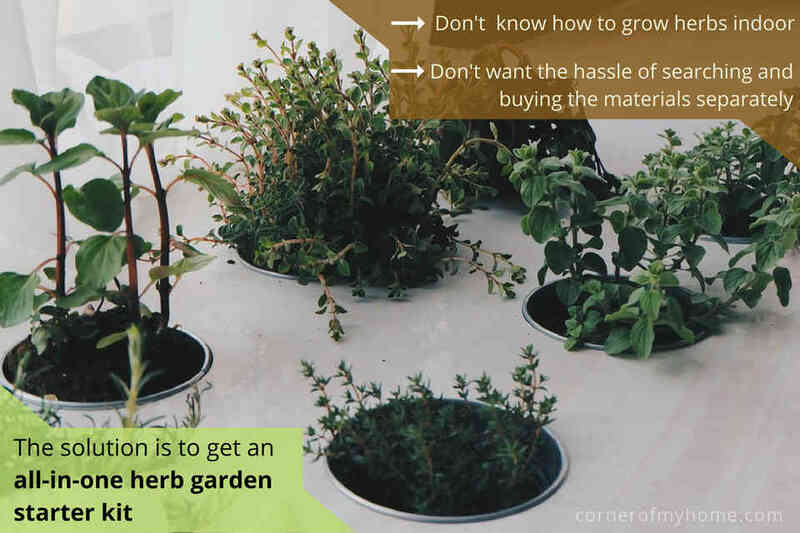 Now that you know there are various kits on indoor garden herbs for beginners to start off with, do not let the “don’t know how” or “too troublesome to buy all the supplies” stop you from growing your own herbs indoors. The starter kit is an innovative solution that gives you the solution to start growing them. Furthermore, this is an impressive and unique gift for someone special. Don’t you think so? In addition, you won’t need to buy herbs by the bunch at the supermarket, only to throw some away when they dried out. No more wastages. Once you get to experience the whole growing process and decide which herbs you like, you may then proceed to buy the supplies separately to grow your herbs indoors. Click here to find out how to grow herbs indoor year round. Before I leave you to check out the herb garden kits, please share your experience in growing or using herbs in the comment section below. Also, do you see yourself using this kit and how do you feel about giving this as a gift? I would really love to start an indoor herb garden so i am glad i have found your post. 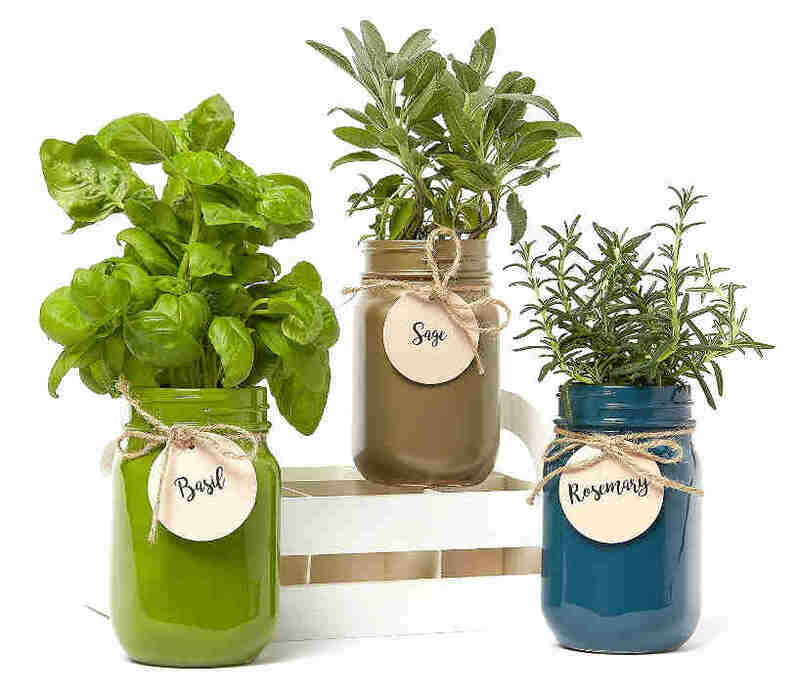 I like the look of the mason jar grow your own herbs set. One thing i will ask do they cause any sort of green fly? as i am really not keen on any sort of fly. 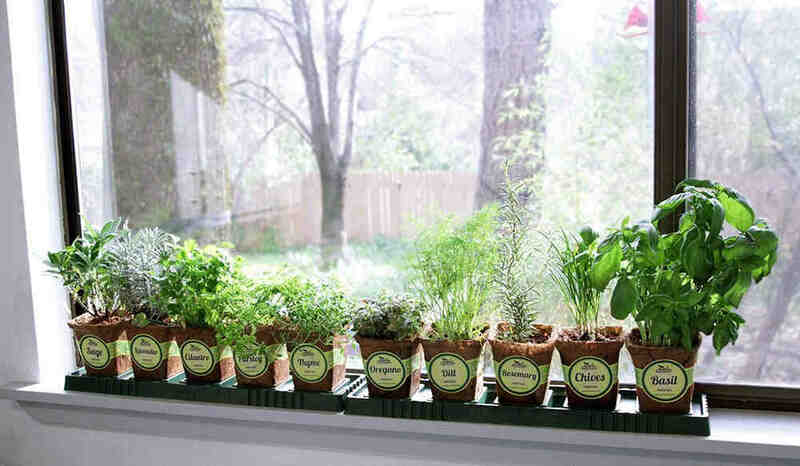 Ways to use your herbs wow so many uses, i am going to attempt to do this as it also looks fun to do. The mason jar herb kit looks beautiful don’t they? I love it too. Flies can be irritating, I understand that. You will be glad to know that herb plants are good insect repellent. Especially basil, rosemary and mint. Here you go, another benefit for growing your herbs indoor. Go on, try growing yours. Easily done with the herb garden starter kit. I have always wanted to grow my own ingredients in the kitchen. I cook A LOT and everything I make is made from scratch. Unfortunately, I do not have a green thumb, lol. I have killed nearly everything I’ve tried to grow, except for succulents and orchids (I don’t know how these are alive and healthy). 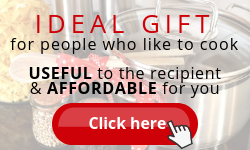 I’m going to purchase the “EASYSTART KITCHEN GARDEN HERBS – ORGANIC HERB KIT”. Wish me luck! I am excited and hopeful! I am glad this article has given you the information needed and helped you to quickly decide which one to buy. All the best in growing your own herbs! Please let me know how it turns out for you. I like your article Sharon I grow an outside garden every year. I’m just wondering how this herb would grow and the garden alongside corn and tomatoes and maybe lettuce an cabbage? 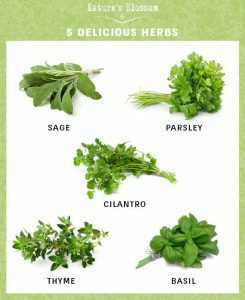 In fact, there are benefits to growing herbs alongside vegetables. Some herb plants actually help repel insects and pests. Conversely, some may draw nutrients and moisture from companion plants. Therefore, you need to know which herb plants go along with the vegetables you’ve mentioned. I found an article here that will help you with the pairing. Hope this helps and happy growing! Hi Sharon, I really like the idea of an indoor herb garden. The Window Sill with the square planters I think was my favorite in this review and I like that you can choose from a variety of herb options. Are there any pre-planted options available? My thumb is anything but green, so the easier the better. I do ok to keep Green onion alive in a glass of water to let it regrow about 3 times. 🙂 Thanks for sharing. Nice to see you here again, Tara. The indoor herb garden is beautiful, aren’t they? Yes, pre-planted options are available on Amazon. You can search under ‘herb plant lives’. 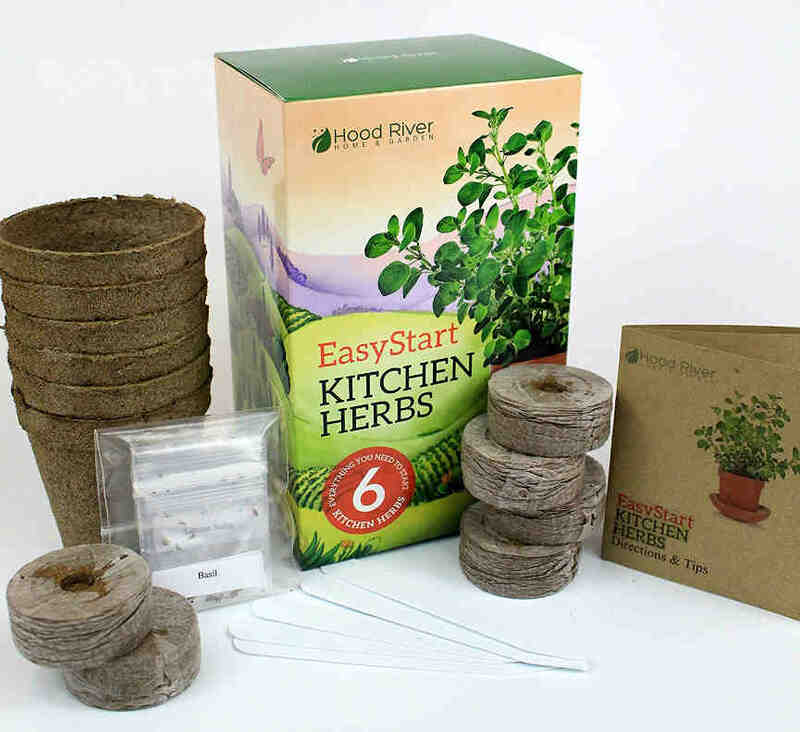 The herb starter kit is meant for anyone who loves to start growing their own, green or not. It will be a good project. Try it! 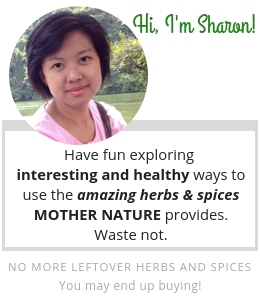 Hi Sharon, thanks for your review regarding the various kits for growing herbs. We have a south facing kitchen window that’s ideal for growing herbs, we’re currently looking for some inspiration. 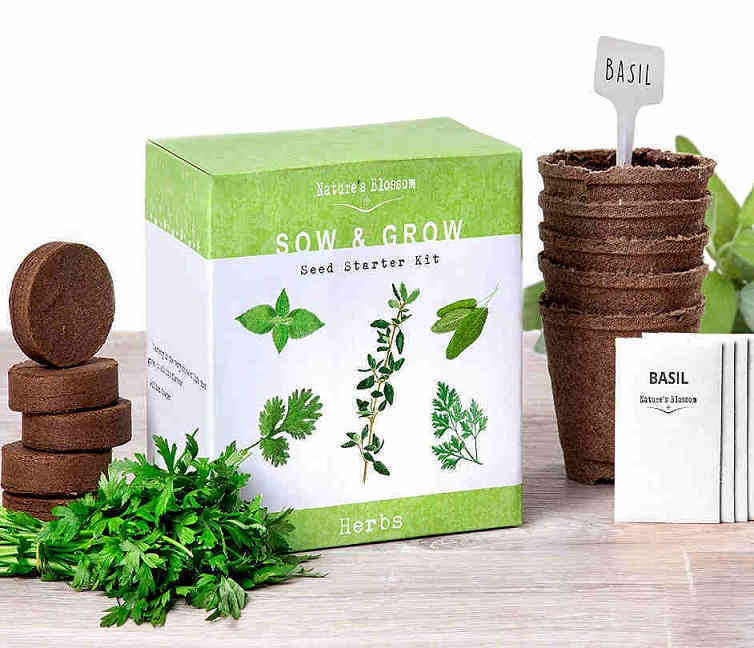 The Herb Garden Starter Kit – Sow & Grow by Nature’s Blossom’s captured our interest as a starter due to comprising Basil, Sage, Thyme, Parsley and Cilantro; herbs we regularly use. Are there any herbs you would class for the more experienced grower or are they all pretty straightforward to grow? We are newbies to growing herbs. Hi Simon. Great to know that you’re interested in growing your own herbs. 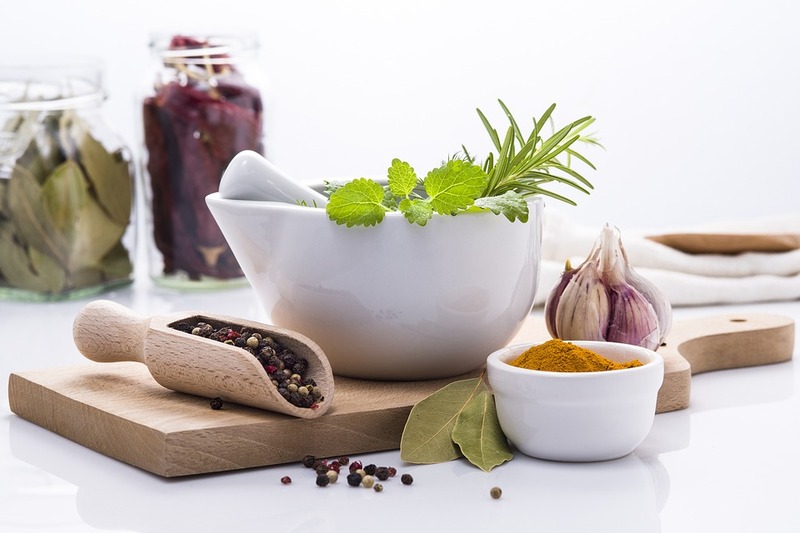 Most of the Herbs Starter Kits are pretty straightforward to use. Try it out and as you get to know the steps better, you may consider growing your own without using the kit. The benefit of using a Starter Kit is that it provides everything for you to start your little project. There is no hassle in searching for the supplies separately. Besides growing from seeds, some herbs can grow well from cuttings off the matured plants. Click here to find out how to grow herbs indoor year round. It explained the best types of herbs to be grown indoor and step by step guide in growing from seeds, transplanting and propagating. Please free to contact me should you need help. Let me know how your herbs growing session go. I’d never heard of a herb called Cilantro before. I had to look it up on Google to learn that it’s just another name for the same plant that we call Coriander. I must give one of these indoor herb gardens a try. I’ve not had much luck growing herbs outdoors. Thanks for putting the kit comparison together. i think the one I’ll try first is Nature’s Blossom Starter kit. BTW, I’d like to try to grow some Turmeric. Know anywhere I can get seed or root from? When I started out, I was confused between cilantro and coriander but quickly found out that it depends on where we use it. In the UK, it is coriander and in the USA, it is cilantro. Glad you had it sorted out. I have not tried growing turmeric but I do have a pot of sand ginger also known as aromatic ginger given to me by my mother. I have no idea how to grow it from the start but just maintaining it without much effort. I have found a very good article on how to grow turmeric indoors, using its root. Hope it will help you get started. Perhaps, I should too. Let me know if I can be of help in other matters and do drop by again telling me how your plant grows. What a variety of starter kits. I think the window sill 10 pack would be the most interesting to me. I would just have to get bigger pots for later when they outgrow the starter pots. I do have many indoor plants now, adding some herbs will increase the value of the plants that I have. Thanks for your article and information. They look beautiful, don’t they? It may be a hassle having to transplant them at a later stage but for the love of gardening and fresh herbs, I ain’t gonna complain. Hope it works out for you. 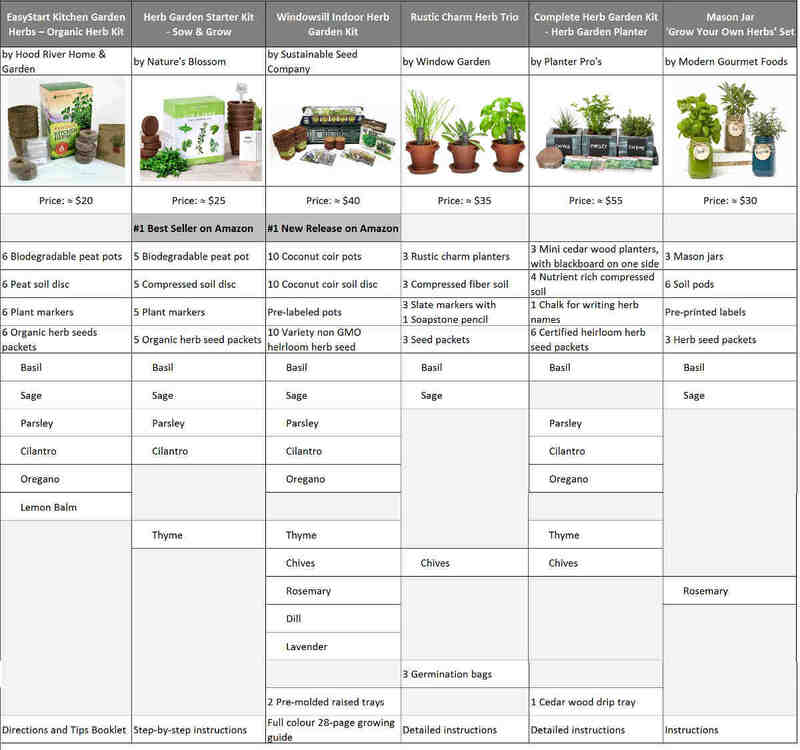 Thanks for your post about indoor herb garden kits. I am especially grateful for your tips on dealing with mold. Mold has been the reason for me giving up on the whole thing. I have a heavy hand with water, I think. Every time I try to grow stuff indoors I get the dreaded mold and, like you, my tendency has been to dump the pot. It puts a major crimp in my indoor growing thing. So, it is just not me alone dumping the pot 😉 Hopefully, from now onward, you will be able to grow them successfully indoor. Light exposure plays an important role too. Ensure your herb plants get at least 4 – 6 hours of light. Check out these grow lights if your herbs need a bit of help with lighting. Oh I have wanted to do this forever and a day. I eat healthy, salads, veggies, and I am always buying herbs which literally costs a fortune at the market.. To have fresh herbs on hand is what I’ve been so thinking about, but honestly, I never really had the ambition. This takes the ambition right out of it. I am psyched, actually, about the Windowsill Indoor Herb Garden Kit. It’s a little more than the other ones, but it’s gorgeous, and it comes with more herbs. I don’t know what the coconut cor does for the herbs, but I know I have a coconut filter water bottle I use that infuses my water with nutrients, so it must be pretty good for plants too. Non GMO also. SOLD! Hello. I am glad you found the right one. Coconut coir helps improve drainage while retaining moisture at the same time. These are important to prevent root rot. Do let me know how the herb garden kit works out for you. After reading your article I think I’ve come to the conclusion that I would use the square planters option on the windowsills of the home – I have rather large window areas around our house! If I wanted to move this herb garden out into the main garden over the summer months – would it be safe to plant them near a vegetable patch or would this effect their growth? Nice to see you here again. Glad you found your ideal indoor herb garden kit. Planting herbs near a vegetable patch can be beneficial to the growth of the veggies. It is called companion planting. Example: Growing basil near tomatoes help repel flies and mosquitoes. And mint near cabbage deters white cabbage moth. I found a website with very interesting and good information here. Hope this helps.